The Cumberland & Dumfriesshire Farmers Mart P.L.C. had forward 1,124 ewes with lambs and 204 store hoggs at their weekly sale at Longtown on Tuesday 11th May 2010. Ewes with lambs at foot were a similar trade. Ewes with singles:- Cheviot Mules £62 East Middle; Greyface £61 Greenknowe; Texel £56.50 Bayles; Suffolk £52 Waynrigg; Hill Cheviot £50 Underburnmouth and Cairndoon; Swaledale £36 Glendhu; Blackface £34 Collinbank. Ewes with twins:- Texel £56 High Dovecote; Greyface £56 Underburnmouth and High Dovecote; Suffolk £52 Waynrigg; Lleyn £51.50 High Dovecote; Cheviot Mule £50 Whitstone Hill; Hill Cheviot £46 East Middle; Swaledale £34 Glendhu; Blackface £30 Underburnmouth. Shearlings with singles:- Cheviot Mule £58 High Chesters; Lleyn £58 High Dovecote. Shearlings with twins:- Lleyn £58 High Dovecote; Greyface £56 Cairndoon. Hoggs with singles:- Texel cross £70 Gall. Store hoggs still wanted to £70.50 for Texels from Shaw Cottage who sold Cheviots at £58.20, Blackfaces at £63.20, Suffolks at £56.20 and Greyfaces at £53.20. 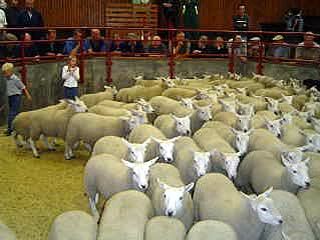 Cast ewes to £87 for Texels from Carpet Farm; Greyface £82.50 Borthaugh.